Even if Kythnos is considered to be a destination suitable for relaxing holidays, there are a lot of places that invite you to have a drink. Here in Loutra you can enjoy a cocktail in one of the bars that stay open till late, while Chora and Merichas will surprise you with the bars and clubs that keep the fun alive till early in the morning. Have fun! . The coastal area that hosts Kythnos Bay Hotel owes its name to the thermal springs situated here. There are two springs: the first one, the spring of Agii Anargiri, is saline and it is located in the Thermal Spa with a long history. The second one, the so-called Kakavos spring situated 50 kilometers from the spring of Agii Anargiri is an iodide, bromide and sodium chloride spring and its temperature can reach 52οC. A part of the thermal waters pours in the sea, in a specially designed cistern-like area made of stone, where visitors can enjoy their therapeutic effect which for free. Except for Loutra where you can find Kythnos Bay Hotel, the capital of the island known as Chora, and Driopida are two residential areas with a traditional character that are worth visiting. Chora:Chora or Messaria is the capital of Kythnos and has a vivid Cycladic character and the authentic atmosphere of an island, located amphitheatrically on a hillside 8 kilometers from Merichas, the port of Kythnos. Wander around the area and discover small places, picturesque cobble streets, white houses with colorful doors and windows, stairs, arches, windmills and churches with unique architecture and decoration. Here you can also find traditional restaurants, coffee places, pastry shops and any other kind of shops. 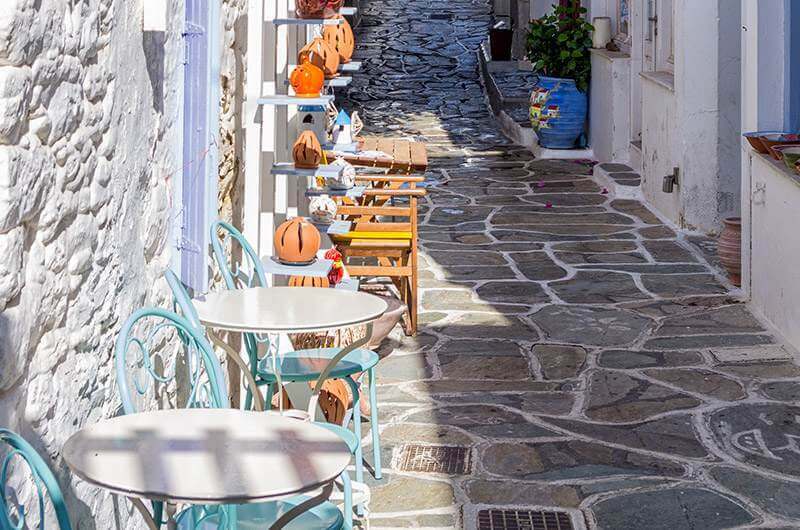 Driopida:7 kilometers from Chora, Driopida is distinguished for its traditional houses, the so-called Spitares, a particular kind of architecture among all Cycladic islands due to their rooftops made of tiles. In this area with a long tradition in ceramic art you can see old churches, beautiful small places, picturesque streets and arches. The Byzantine Museum, the Folklore Museum, the War Memorial and the Cave of Katafiki are also situated here. The Folklore Museum of Driopida: The Folklore Museum of Kythnos is situated behind the church of Agii Apostoli in Driopida, and it hosts objects of everyday life in the past years, folk art objects and traditional local costumes. The Ecclesiastic and Byzantine Museum: The ecclesiastic museum is situated in a specially designed area in the church of Agios Georgios in Driopida. It hosts numerous ecclesiastic exhibits from the Byzantine era and religious icons that survived the test of time. The Cave of Katafiki: In Fires close to Driopida, you can find the cave of Katafiki, one of the biggest caves in Greece which includes amazing labyrinths decorated with rich and impressive stalactites and stalagmites. Only a part of the cave is accessible to visitors due to reparation works to the ceilings of the cave. Katafiki means refuge, as the cave has been used as a shelter during the pirates’ era. The Castle of Oria: In the area of Kefalokastro you can see the relics of the castle of Oria. Up to the 16th century, the Middles Ages capital of the island was situated here. It is worth visiting the abandoned houses and the old churches, and admire the wild beauty of the area. Maroulas: It is the only residential area dating from the Mesolithic area found in Greece. 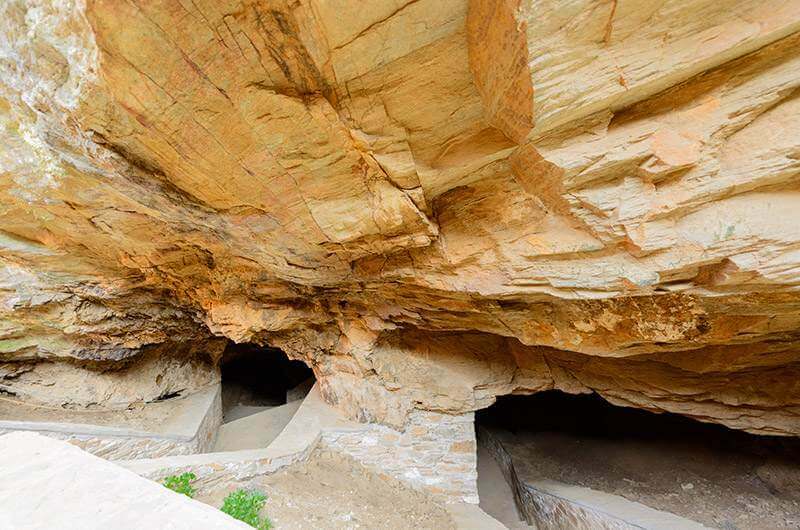 The excavations unveiled circular houses, tombs and a human skeleton, as well as stone objects used during that time. The traditional celebrations: Kythnos, like all Cycladic islands, is renowned for its traditional celebrations. Among the most important ones we count those organized in honor of the Virgin Mary for the day of the Assumption (Holy Virgin Nikous, Holy Virgin Stratilatissa, Holy Virgin Kanala) as well as the one of the 8th of September in the church of Holy Virgin Flampouriani. The traditional celebration of Saint Apostles in Driopida and the celebration of the Holy Trinity in Chora are also very famous, as the two villages celebrate the anniversary of their cathedral churches. Places of worship and piety, the churches in Kythnos, like all the churches in the Cyclades, decorate the dry Cycladic landscape with their beautiful and usually white architecture. The patron saint of the island is Ignatios Kozadinos from Marioupolis. It is worth noting that 2016 is the year of town twinning between Kythnos and Marioupolis. 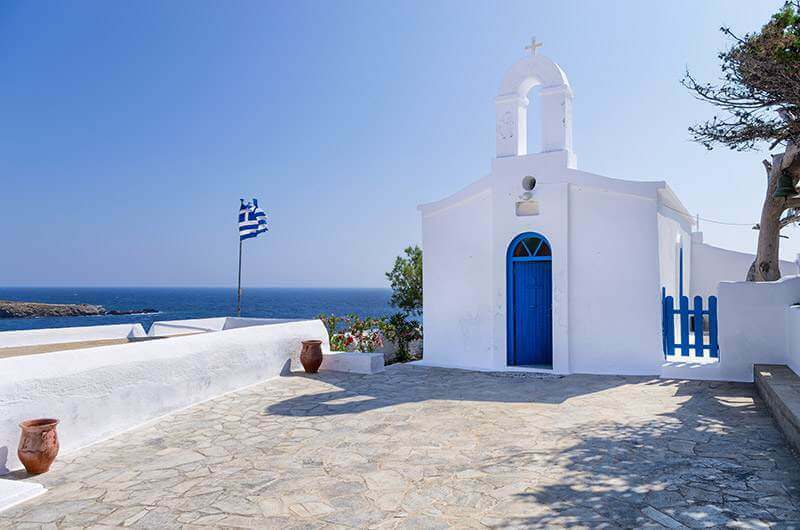 The church of Holy Virgin Kanala: It is one of the most important places of worship in the Cyclades. It is situated in the homonym coastal settlement of Kythnos at the southeastern part of the island and it is considered to be miraculous. A big traditionalcelebration is organized every year to celebrate the Assumption of Mary, with the circumambulation and the representation of discovery of the holy icon of Virgin Mary. The church of Holy Virgin Nikous: It is situated in short distance from Chora. The monastery took its name from the Byzantine church of the Holy Virgin Nikopoios, and it is built upon the ruins of ancient temples. According to the legend, the holy icon of the Virgin Nikopoios was transferred here from Istanbul during the fall of Constantinople from where Venetians took it to the church of Saint Marco in Venice where it remains tills nowadays. The church of Holy Virgin Flampouriani: It is located in the northeastern part of the island at the bight of Flampouriani, at the edge of a cliff. According to the traditional legend, the traces on the way from the beach to the church belong to Virgin Mary. The church of Holy Virgin Stratilatissa: It is located 3 kilometers away from Driopida. You can admire its temple with the amazing holy icons dating from the after Byzantine era. The church of Saint Minas: Situated in Driopida, it has an amazing wooden temple, a throne in folk art and an impressive representation of the dead body of Jesus. The church of Saint Savvas: It is situated in Chora. The sign above the door unveils the year that the church was built (1613). Schinari: A small windless beach in walking distance from Loutra. Agia Eirini: A small beach opposite Loutra. 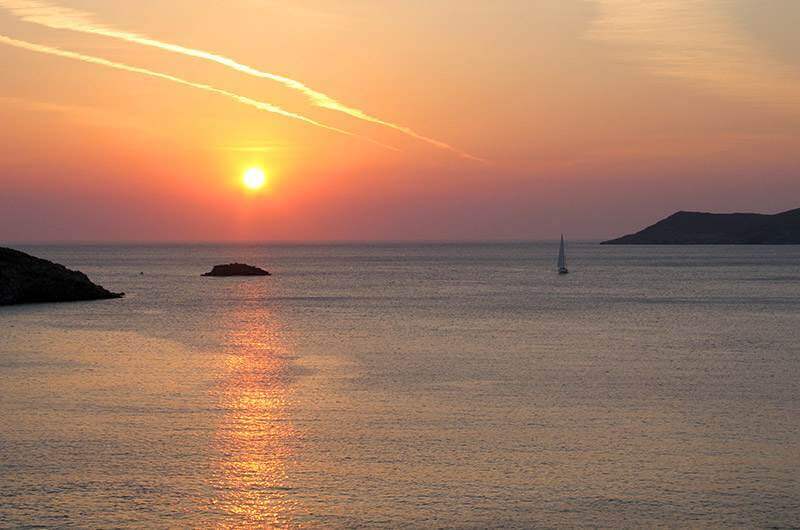 Kolona: An organized and very popular beach, Kolona is one of the most beautiful beaches in the Cyclades. Here, a line of sand is dividing the sea in two offering two areas of sand in the same beach. Episkopi: It is an organized sandy beach in a beautiful windless gulf full of tamarisks. 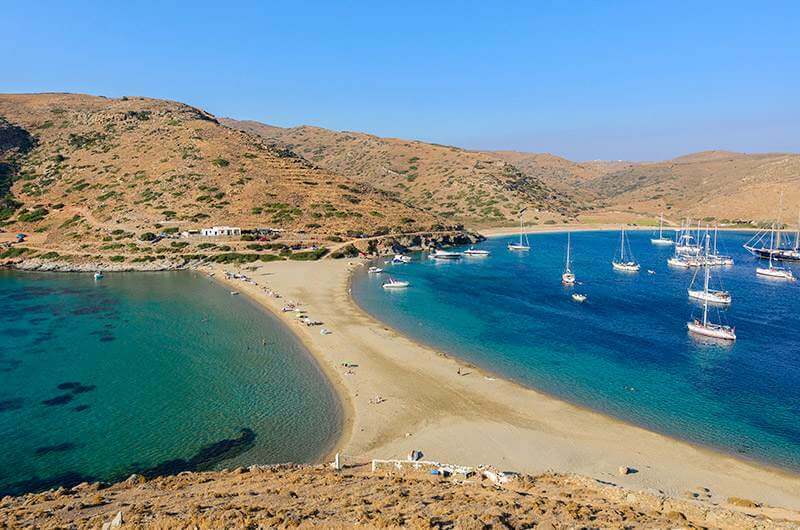 Apokrousi: One of the biggest sandy organized beaches in Kythnos with a lot of tamarisks. Agios Sostis: A very beautiful beach at the northern part of the island with small cobbles and sand. It took its name from the homonym church. Potamia: Going towards Agios Sostis you can find the beach of Potamia which is windless and offers a thick shadow. Megali Ammos Kanalas: A big and sandy beach situated at the gulf on the right, below the church of Panagia Kanala. Antonides: A beautiful beach with crystal clear waters. Skilou: An amazing sandy beach situated at the eastern part of the island. Gaidouromantra: Another sandy beach with crystal clear waters. Agios Stefanos: A protected and sandy beach at the eastern part of the island with small cobbles and the thick shadow of tamarisks. Flampouria: A big sandy beach with small cobles. The church of Panagia Flampouriani is also situated here. And there are many more beautiful beaches, such as: Agios Dimitrios, Naousa, Zogaki, Kalo Livadi, Lefkes, Martinakia, Simousi, Petrousa, Stifo, Fikiada. The marina of Loutra is a famous destination for yachts and boats. 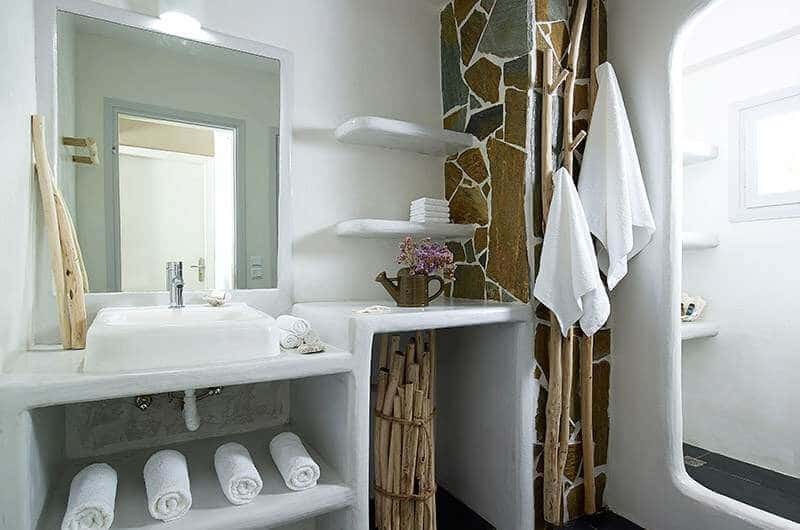 In Kythnos Bay Hotel, we have created for you a comfortable shower room which is also at the service of yachts and boats passengers. A laundry service is available upon request. There are a lot of shops waiting for you in Chora and in Driopida. You can wander around the narrow streets and discover handmade jewels, artistic creations, traditional objects of ceramic art, local Mediterranean diet products such as honey, pasteli (sesame flapjack) and sour cheese, and many others. For the end of your holidays, you can also find numerous souvenirs at the shops around.